Review: Muse - which of you is the best inspiration? 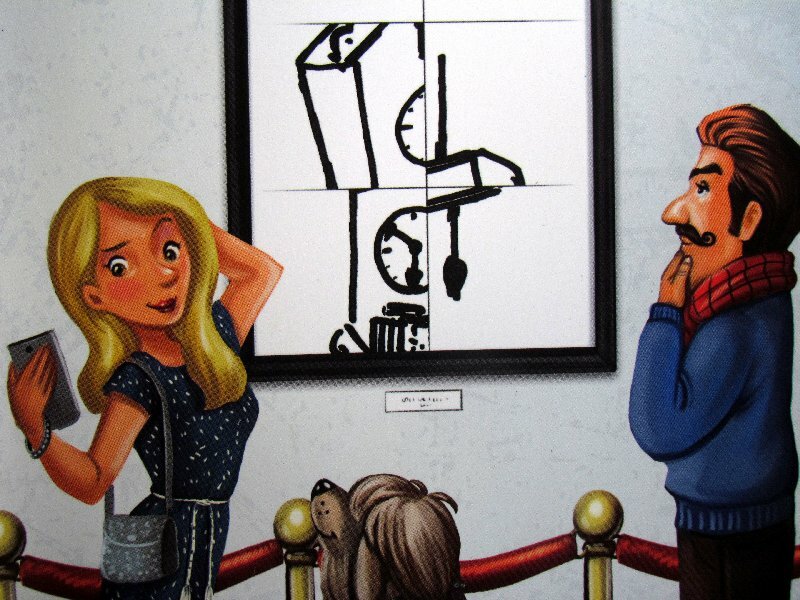 Modern art is field of interest, where even most self-effulgent idea could become reality. But it still does not mean anything unless the judges see promising talent in you. Even yesterday, our gallery was proud of a unique collection of new creations, but now we can see only empty pictures and stands. There is no time to look for them. Critics will come in the morning and we have to have something to offer to them! 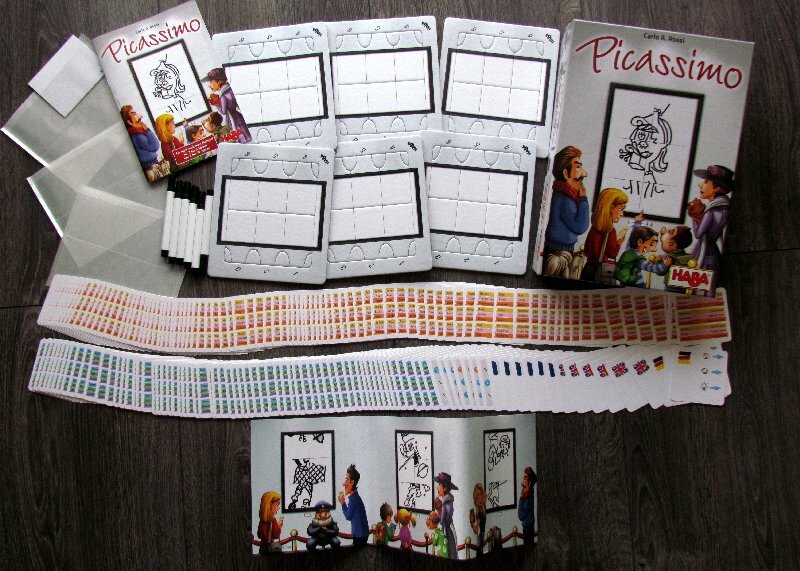 An artistic mystery was created for us by Carlo A. Rossi, who designed a new drawing game called Picassimo and offered it to the German company HABA for publishing. The game fit well their new concept of family games and was released in 2016 with illustrations by Christiano Fiore. White box has larger dimensions in height and its not small at all. 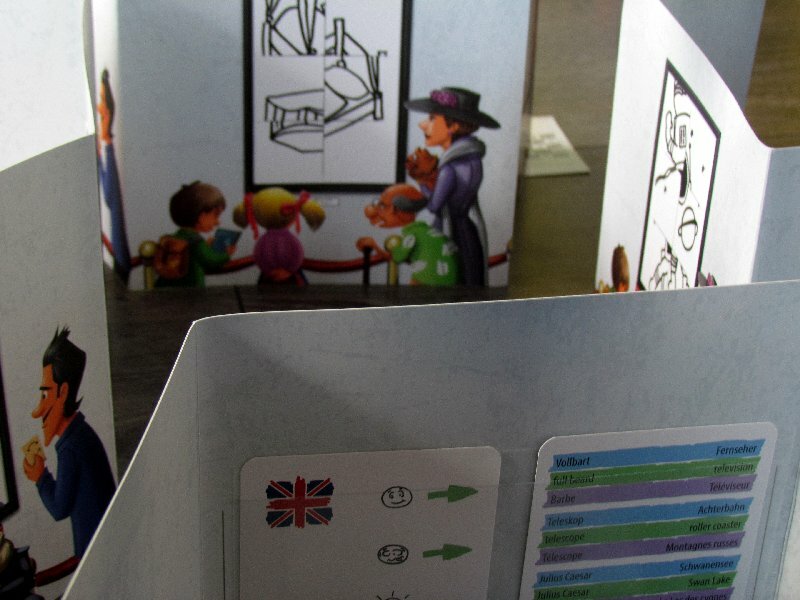 Inside, player find a set of screens made of thick paper. 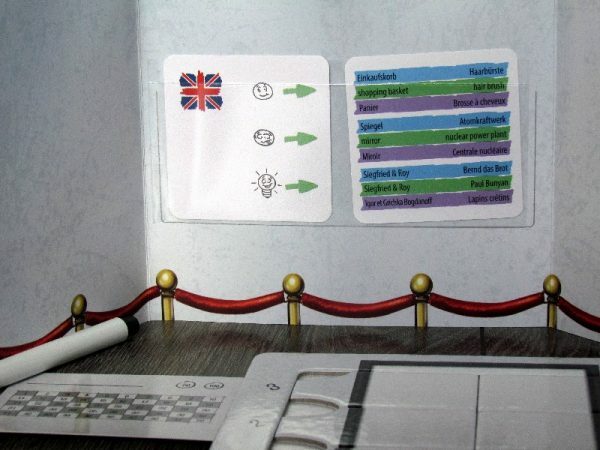 Everyone has not only different images on the front but also a plastic pockets inside (these are created when unpacking by fixing plastic pockets on it). 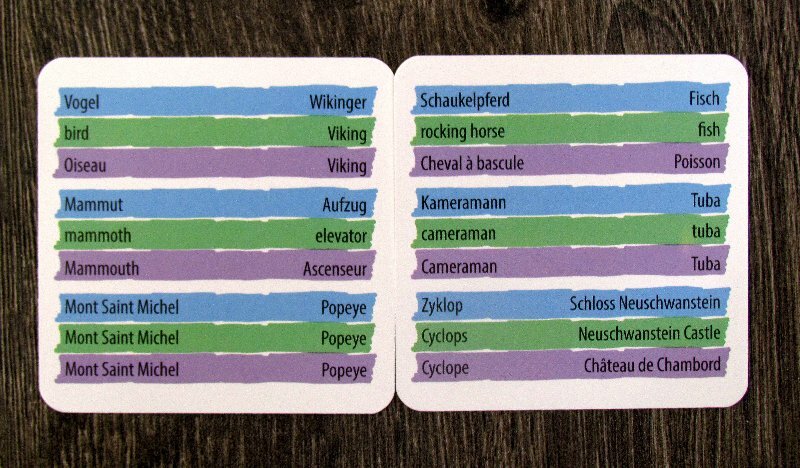 At the very beginning, everybody also gets card of his language (there are several languages to choose from). Players each receive one such screen, they get a marker, a scorecard (mark it by its name), but above all a drawing board. 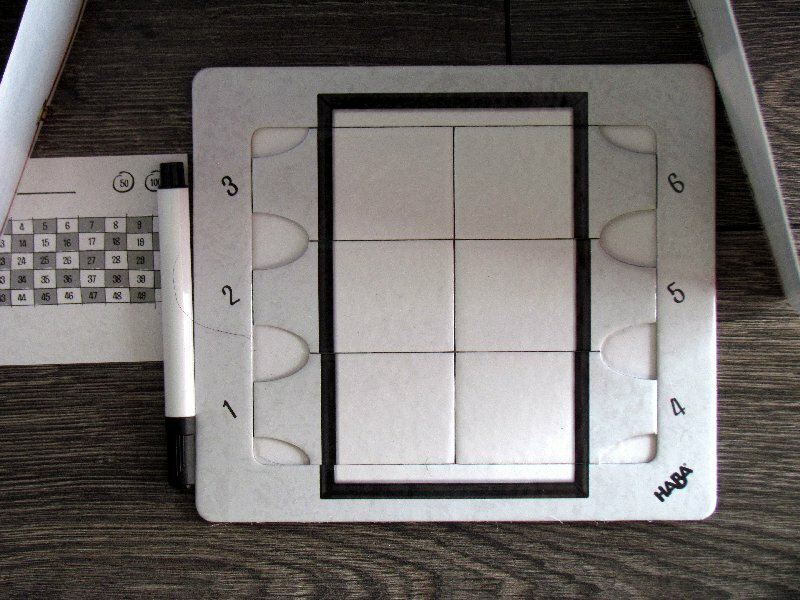 It is also made of cardboard and it is divided into six separable tiles. 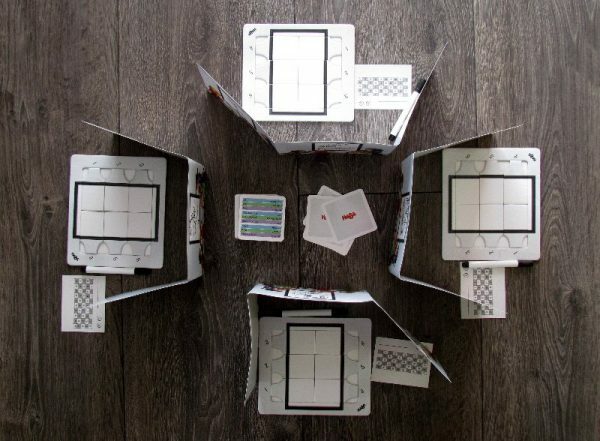 At the center of the table, seven cards are shuffled with transformations, that provide surprise to the players each round. Next, they also place a stack of task cards. They have double-sided print, so players should watch carefully, that text in their language is not visible and they can reveal the cards gradually as the game progresses. After that, the opponents will only choose the difficulty of the tasks they will be waiting for. All participants will draw one card at the beginning of each of the seven rounds and by doing that, they receive their special task word. 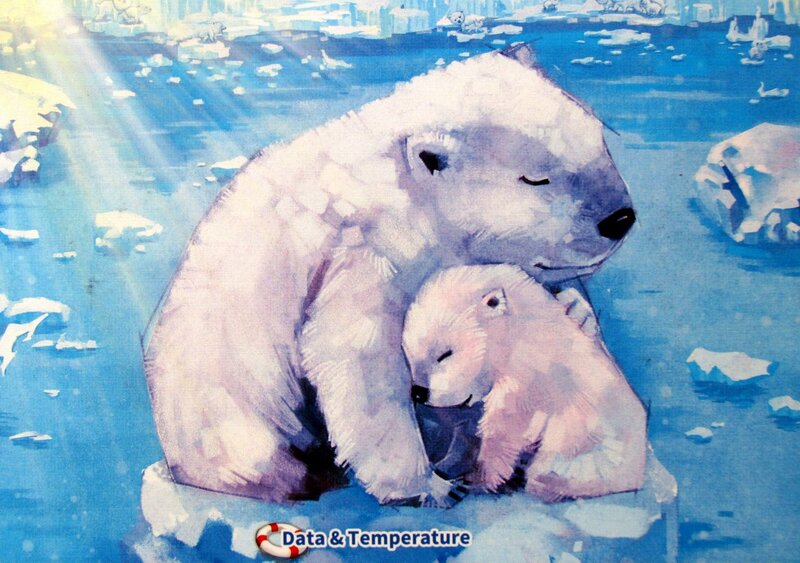 Depending on the difficulty, two expressions will appear on the card, from which he can choose as desired. This card is then inserteds into a plastic pocket on his screen, everyone hold firmy the marker and they all begin to draw at the same time. 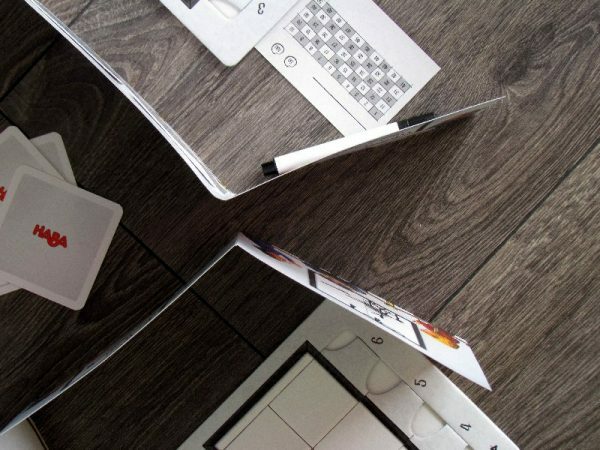 Players try to word they read on the card up to their best drawing skills. In doing so, only the rotation of the board has to be maintained, so HABA logo is not upside down. This will be important in a moment. All six parts of the canvas needs to be filled – each piece must have at least one line. As soon as most players have finished their work, they count down from three to one and end of the round comes. 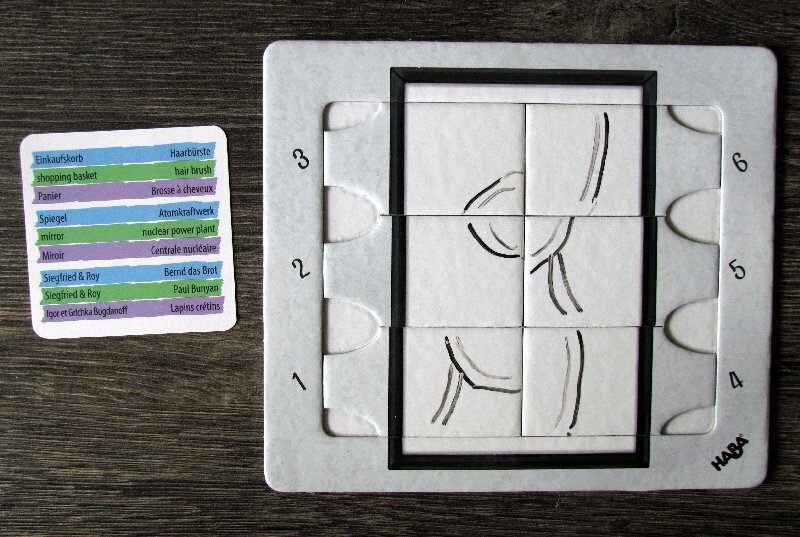 Then the players reveal a common card of transformation and according to its instructions, they have to shuffe up their parts of canvas. The image suddenly looks completely different, and at first glance it is not easy to see what was it before. One after another, they reveal their plaque to the others and they have a clear task – to be the first to guess task, that the player drew. If someone answers correctly and names what’s in the picture, he gets three points for his reward. The artist will receive the same amount. If no one answers correctly at a predetermined time, then its author gradually puts the pieces back to their correct layout. But others can still guess. Right answer at this point means just one point for both the artist and the right guy. The game continues by erasing the canvas and next round can begin. There are seven in total, with players scoring towards success. The one, who has the most points after all rounds is the winner. Picassimo is another drawing game that will test your imagination. Treason here is, that it is not enough just to know the picture. It does not look the way its author has drawn it. Before you get to see it, some of its parts will be switched.Well, at first glance, you can hardly know, what it was, but you will have to try. If you do not see it quickly, then it’s good to start to reconstruct the original picture backwards in your head. You get ideal help in the role of transformation card. 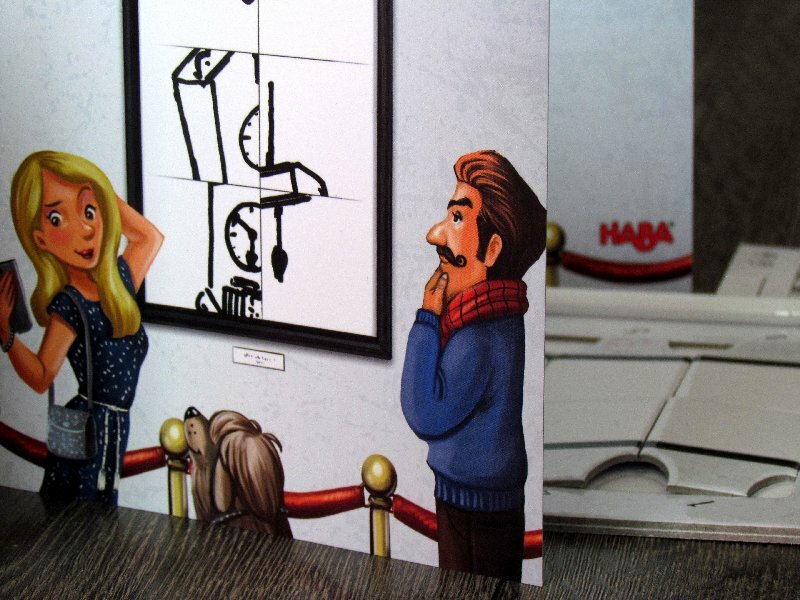 With a little concentration and time sacrifice, it’s possible to imagine all parts of the artwork in their original places. But in the meantime, opponents are trying to guess all at the same time and there is a big chance that someone gets it right just by guessing. So players have to decide which of these ways they will go – making tips or reconstruction? Both can bring points. It is precisely that striking emphasis on imagination, that distinguishes Picassimo from its competitors. But the game still remains relatively fast because everyone has the motivation to be as quick as possible. Otherwise, they can end up with an undecorated picture and no one wants that to happen. Painter will also get points if someone guesses his creation right. But much more emphasis is on the guessing. The fact that you are not good at drawing does not mean anything. If you can easily and quickly recognize works of others, you can still win. 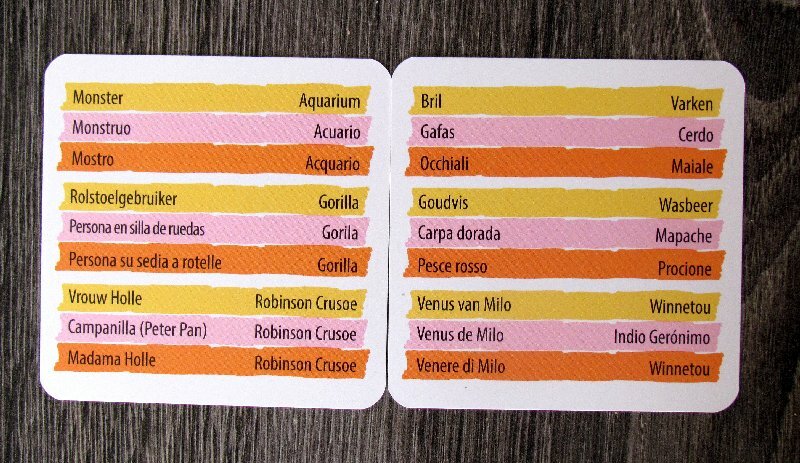 The more opponents participate in the match, the more points come from guessing and less from drawing. This would suggest that players do not have to work hard for a compelling illustration. But they would be taking away lots of fun. The themes on the cards are good. Players will find animals, as well as architecture, artist or professions. Vinnetou, Little Prince, butcher or Pulp Fiction. Every task is fun to do, and it is also fun to guess the drawing of others. Here it is clear that the game will be a success especially with families. 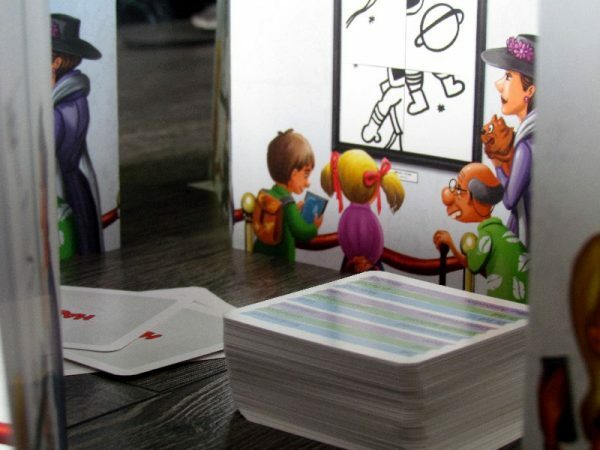 It can be played both by parents and children, but you can also invite older rivals. Everybody can guess, although children may be slightly handicapped in some themes. 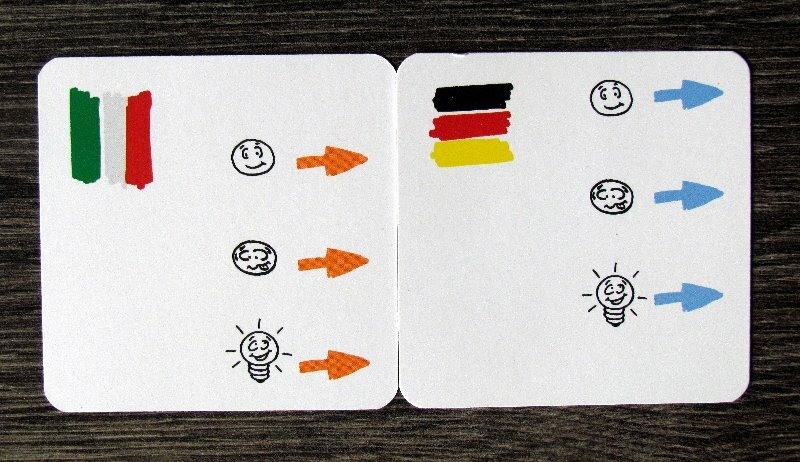 Switching is always made with four tiles and the arrows cause the players to swap two tiles, while others with rotation. 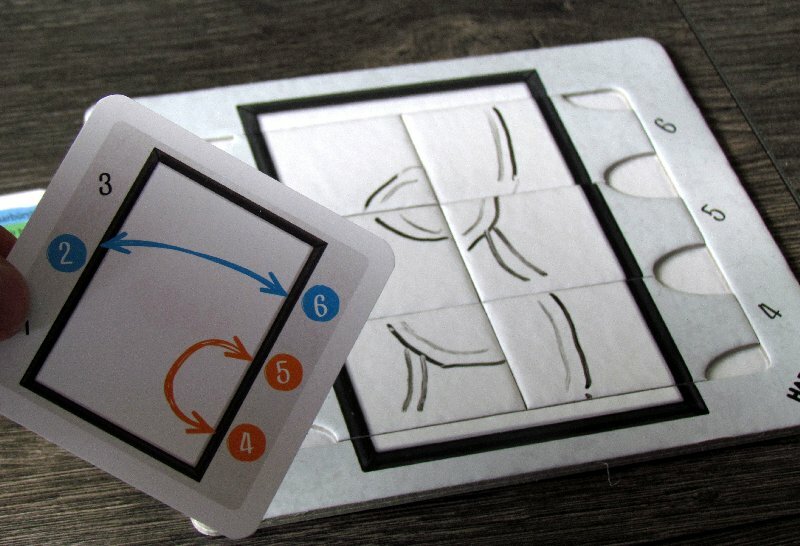 That’s why it’s also important to rotate the entire board, when guessing, so players can have good orientation. Somebody might argue that it’s all about drawing. And he’ll be right. But it does not matter because the game is still fun. It could also happen, that player knows languages from both sides of card. This would be quite an inconvenience as he would know the goal in advance. Picassimo did it. Drawing games generally are fun and this one even brings a pleasant fresh breath to the genre. 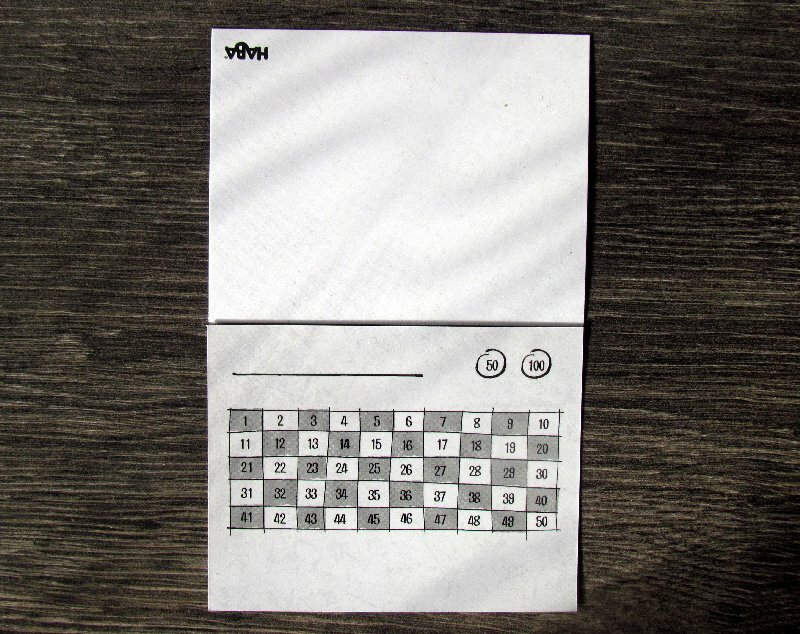 The game is about drawing and guessing, but it brings an interesting twist to the game. The player is enjoying not only making guesses, but above all have fun from crazy switched drawing pieces. Sometimes, really absurd pictures come out. 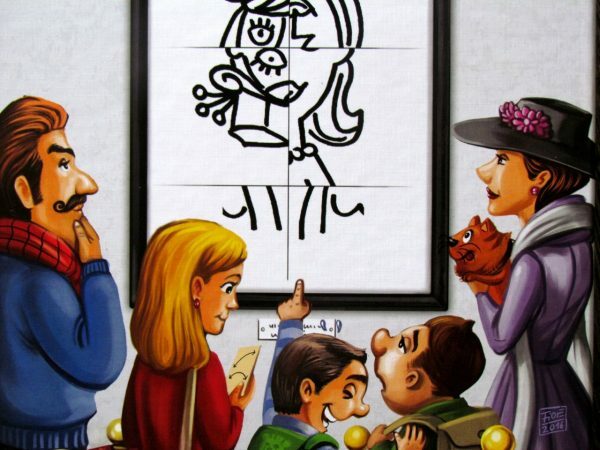 Picassimo brings laughter with it and that certainly counts. 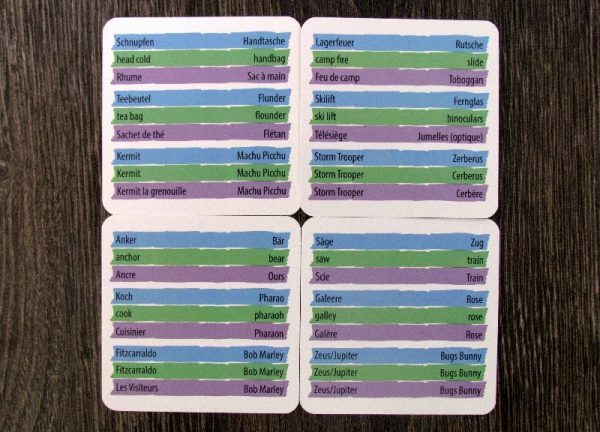 Picassimo is a game in which players simply get a marker and text assignment. According to task, he draws a picture on the canvas and could immediately show it to others to begin an argument. 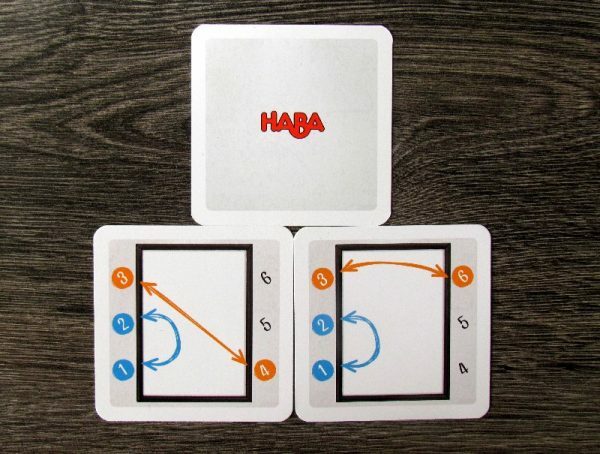 But instead, he must first all tiles containing his work rearrange based on movement card. Sometimes, very humorous pictures are created and players will get entertained. To do this, a large number of assignments and solid processing have to be appreciated. All of this makes Picassimo into a nice cartoon fun for families.